Rental License-City of Key Colony Beach. The owner, Carole has owned/managed properties on KCB since 1998. This 'Tropical Island Paradise' is a great private and spacious (over 2,000 sq. ft. living space) single-family ground level vacation rental -- 'perfect for two couples or two small families to share'. This property is located in the Island Village of Key Colony Beach near Sunset Park on the Ocean. Within walking distance to fine dining, post office, 9-hole golf course, tennis and world class charter boat fleet. One block from the beautiful Sunset Park on the ocean. Cabana Club Membership (Beach/Pool), May use Boat Dock & trailer parking - no additional charge. Sleeping arrangements are 2 KING beds + sofa bed. This home has 2 separate King Bedroom Suites - one at either end of home. This home is SMOKE-FREE and CLEAN ! Sleeps 4 or 5 adults comfortably - up to 7 including children. The LARGE (air conditioned) LANAI - family room/dining room overlooks sun deck and the water (canal). The deck is a comfortable spot to enjoy breakfast or morning coffee while watching the sunrise & wildlife. In the afternoon, enjoy a pina colada! Deck is shady and breezy on hot afternoons. Rental is located on the water - a 5 min. boat ride thru our 100' canal that leads to the Atlantic Ocean and Gulf of Mexico. Dock for up to 38' boat at no additional charge -- with fish cleaning table and barbecue grill, along with a sun deck and comfortable chairs and umbrella. Comcast High-speed wireless internet included. This property is maintained & managed by the Owners. (SEE OUR GUEST REVIEWS). New sofa/bed & 2new recliners December 2017. New dishwasher 2014. New flat-screen TV in bedroom 2011. New Fridge 2011. New Air Conditioning System 2013. New plumbing 2012. New mattresses 2015. You will come back year after year as many of my guests do. The islands of the Keys are the Best Kept Secret in the U.S. Bring your boat - rent a boat and enjoy fishing, diving or snorkeling minutes from shore - no need to travel far. Docking and Trailer Parking at no additional charge. Why travel out of the United States when you can get 'island living' on the Florida Keys? Come, Relax under a palm tree -- enjoy all the Keys have to offer. Fishing/Diving/Snorkeling just off shore or rent or bring bicycle or kayak and tour Key Colony & Marathon. Walk or Bike a section of the old 7-Mile Bridge out to historic Pigeon Key. Drive 45 miles to Key West and spend a day shopping/eating/drinking/ people-watching on Duval Street. Take a sunset cruise or watch from Mallory Square. Sunset Park is 1 block away; the Cabana Club Beach is 8 blocks away (an easy walk or bike ride - PARKING also available); Sombrero Beach is 5 miles away; and Bahia Honda Beach is appx 10 miles from Marathon. Small private, remote gorgeous beaches. Bring your Boat or rent a boat and tour the island, the reefs, fish, snorkel, dive - all within few miles of Carole's Cottage. World Class Charter Boats go out daily and are located within a 1/2 mile of the house. No additional charge for use of boat dock or trailer parking. Relax on the back deck - enjoy a drink or a meal - quiet peaceful neighborhood on canal. Enjoy the wildlife - iguanas, white heron, pelicans, ibis, burrowing owls and 'Clementine' (neighbor's pet pig). 3 Restaurants within walking distance - many more in Marathon. Our listing has been on VRBO for over 18 years & ranks in the TOP Listings of all KEY COLONY BEACH rentals! WE LIVE IN LOUISVILLE, KENTUCKY WHERE WE RUN A SMALL, FAMILY BUSINESS WITH OUR SON. WE HAVE VISITED THE KEYS REGULARLY SINCE 1994 AND PURCHASED OUR FIRST HALF-DUPLEX RENTAL UNIT ON KEY COLONY BEACH IN 1998. WE LOVE THE LAID-BACK ATMOSPHERE, THE OUTDOOR RESTAURANTS ON THE TURQUOISE WATER, FISHING, SNORKELING/DIVING, THE HISTORY, THE PARKS, THE FLOWERS, VISITING KEY WEST AND THE OTHER KEYS. WE LOVE THE WEATHER, THE BLUE SKY, THE OCEAN, THE SUNSETS. WE TRAVEL TO THE KEYS 4 OR MORE TIMES EACH YEAR TO MAINTAIN OUR PROPERTY AND TO 'RELAX & PLAY' THERE. WE KEEP OUR BOAT AT THE DOCK IN FRONT OF OUR HOME AND ENJOY CATCHING AND EATING FRESH MAHI MAHI, GROUPER, SNAPPER.WAHOO. WE ENJOY DOING NOTHING, SITTING ON DECK ALONG CANAL ENJOYING A PINA COLADA OR COFFEE OR WHATEVER. WE ENJOY GRILLING OUR FRESH CATCH ON THE DECK. OUR HOME IS 'OWNER MANAGED' ---YOU GET FAST, PERSONAL ATTENTION FROM CAROLE. CLEAN, PRIVATE, SINGLE-FAMILY, 2 LARGE KING BEDROOMS, 2 LARGE BATHS, 2100 SQ. FT. OPEN LIVING SPACE PLUS A DECK, BOAT DOCK, TRAILER PARKING AND MEMBERSHIP TO THE CABANA CLUB (BEACH, POOL) AT NO ADDITIONAL CHARGE. WE LIVE HERE 4 - 6 WEEKS EACH YEAR AND KEEP OUR HOME MAINTAINED FOR OUR GUESTS. YOU WILL FIND OUR HOME CLEAN, COMFORTABLE, PLEASANTLY DECORATED AND A GOOD PLACE TO RELAX, READ, WATCH THE WILDLIFE, FISH OFF THE DOCK, OR DO NOTHING!! SUNSET PARK ON THE OCEAN IS ONE BLOCK FROM OUR HOME WITH PICNIC TABLES, A PIER & GORGEOUS SUNSETS. BRING YOUR OWN WINE! 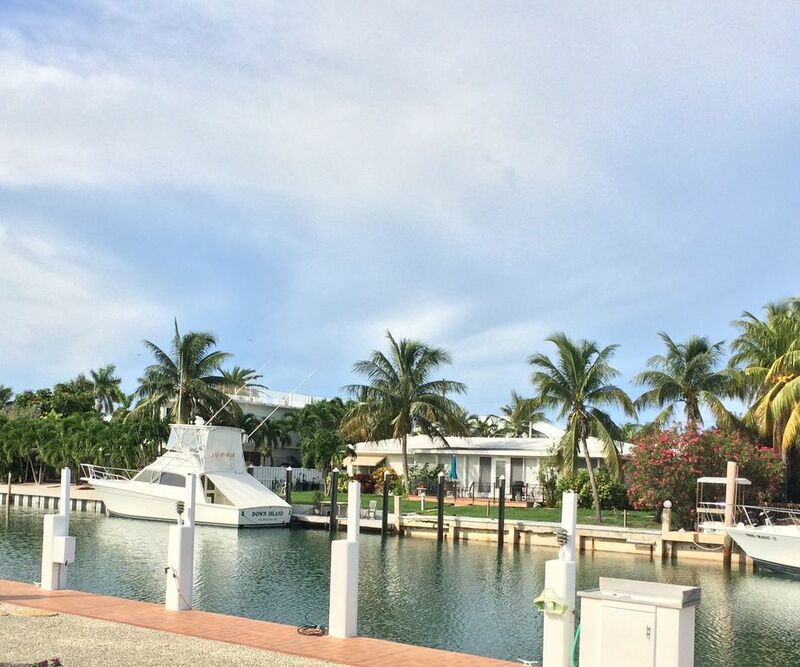 YOU MAY BRING YOUR BOAT AND KEEP IT AT OUR DOCK (UP TO 38') OR RENT A BOAT IF YOU CHOOSE. HOME SITS ON A CANAL THAT LEADS TO GULF/OCEAN, A SHORT 5 MIN. BOAT RIDE TO EITHER. IT FEELS LIKE 'HOME' WITH MANY COMFORTS. WIFI WIRELESS INTERNET ACCESS, FULLY FURNISHED KITCHEN, NEW MATTRESSES (5/15)BED LINENS, TOWELS AND MUCH MORE........... COME AS YOU ARE............ENJOY THE BEACHES, MILD TEMPERATURE, PALM TREES IN THE DEAD OF WINTER OR ANYTIME! NOTE - WE GET BOOKED EARLY (6-12 MONTHS IN ADVANCE) ESPECIALLY FOR HIGH SEASON!! central air in main house - large unit on lanai plus ceiling fans. NEW DUCTWORK & A/C unit installed Oct. 2013. 4 cars in driveway. We also own parking area next to street for additional cars. Boat trailer parking on grass next to garage-- MUST BE 20' from street- KCB regulation. NOT IN DRIVEWAY PLEASE!! Dining Table overlooks deck, dock and canal . . .located on air conditioned lanai. Outdoor deck table seats 4. Kitchen table seats 3. Deck with 2 chase lounge chairs. Umbrella Table and 4 chairs for eating on deck. 4 extra chairs. CLEAN, Owner Managed, This is our 20 th year renting our properties on KCB. Central Air, Heat, Fully equipped Kitchen, Fish-cleaning Table, Boat Dock - can accommodate up to 38'boat, OUR 42' BOAT STAYS AT DOCK. THERE IS TOTAL 112' dock space. Sun deck, Lanai overlooking water, Bait Freezer, Pool/Beach & Hot Tub at Cabana Club included - FREE Shuttle Service Available 305.743.4849 for info, Airport (Marathon)2 miles, SMOKE-FREE AND CLEAN with ceramic tile throughout....and MUCH MORE. Rooms are large - Beds are comfortable. New mattresses 2015. Nicely appointed and user-friendly. Quiet Peaceful neighborhood - No DUPLEX units on12th Street - it is one of the best streets on our island (if not the BEST). Walking distance to Key Colony Inn, Sparky's and Cabana Breezes (the 3 restaurants on the island). Bring your bike (or rent a bike) to ride on the many bike paths nearby. Close to Publix, Sombrero Beach, Bahia Honda Beach, Big Pine Key Deer, Marathon (many restaurants/shops). Beaches, Walking, Biking, Golfing, Reefs - Snorkeling, Diving, Fishing, Relaxing, Antiquing (in Key West).